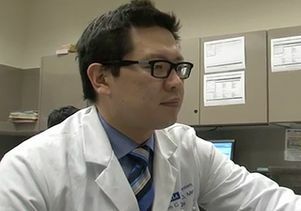 The study, published in the early online edition of Annals of Surgery, is the first to examine the use of social networking to facilitate peer review of surgical procedure videos, said senior author Dr. Jim Hu, the Henry E. Singleton Professor of Urology and director of robotic and minimally invasive surgery in the urology department at the David Geffen School of Medicine at UCLA. Research participants included 41 urology and gynecology residents from UCLA and the University of Michigan who used a robotic surgery simulator to sew and tie two tubes together. The residents were randomized into one of two groups — an intervention group in which the residents videotaped their efforts and posted the videos on a Google Plus group forum for anonymous review and comment by their peers in the same group, and a control group in which participants did not videotape or post their work for review. The residents performed the same simulated robotic procedure three times. The study found that residents in the intervention group improved their technique in subsequent attempts, had shorter completion times and earned better scores from the simulator for technical efficiency, accuracy and economy of motion. "We have demonstrated that social networking can be a viable forum for coaching, both for residents honing their craft and for practicing surgeons," Hu said. "Technique matters, regardless of what type of surgery you’re doing. Surgeons who invest time in reviewing their techniques on video and seek the feedback and coaching of others ultimately will do better in terms of performance." Hu said online peer review of a surgeon’s techniques may one day become a paradigm for giving surgeons privileges to operate at some medical institutions. Because this platform is anonymous and accessible, without time restraints or the need for a coach to be in the operating room during a procedure, it can greatly improve the quality of surgery among trainees, young surgeons who have just completed training and more experienced surgeons seeking to refine their technique or adopt new technologies with challenging learning curves, such as robotic surgery, Hu said. For the study, the residents in the intervention group, after viewing the videos posted anonymously on the Google Plus group forum, anonymously posted comments on the performances and offered tips for improvement. Comments included such suggestions as "be a little easier on the tissue" and "zoom in with the camera for better visualization." Hu said certain medical specialties can be slow to adopt new technologies, so this would provide an "egoless" opportunity to improve technique. Additionally, more experienced surgeons often don’t have time to coach younger surgeons, while older, more proficient surgeons can be reluctant to seek help from junior surgeons. "Surgery can be very hierarchical," he said. "When the robot came out a decade ago in urology, the people who really embraced it were the younger doctors. Many more established surgeons were resistant, claiming it wasn’t as good as open surgery. It can be very humbling for the more experienced surgeons to get coached by surgeons with less prestige." However, using online peer review through social networking protects the identities of those reviewing and commenting and those whose craft is being examined. Surgeons can check their egos at the digital door, Hu said. "Our study demonstrates the efficacy of peer feedback through social networking, a novel paradigm for technical mentorship," the study states. "A benefit of using social networking as a forum is that it may serve as a vehicle for neophyte surgeons to receive mentorship from experts without the limitation of geographic distance or time constraints. Peer feedback of the online surgical video offers anonymity for all involved and therefore removes potential barriers due to competitive surgeon egos. It may be a paradigm for continuous technical improvement beyond residency or fellowship training, which is critical with rapidly adopted new technologies such as robotic surgery."